Theralase therapeutic laser treatments use cutting edge technology supplying energy to the body in the form of billions of photons of light. This safe, effective and painless therapy uses the body’s own natural healing systems to promote cell regeneration, relieve pain and inflammation. Over 2,000 clinical studies world-wide continue to prove the success of therapeutic lasers in the stimulation of healing and the relief of pain and inflammation. It is a proven modality that effectively stimulates deep tissue regeneration. 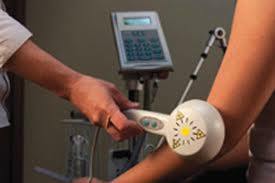 We offer fast, effective and safe Laser Therapy treatments. You can have a healthy, pain free lifestyle. Health Canada and FDA approved. How can Therapeutic Laser Treatments help me? Results from laser therapy are often immediate with no side effects. Efficacy rates in excess of 90% are routinely achieved. How long does the therapy take? Treatment time will vary from as little as 2 minutes to 20 minutes. The total number of treatments required varies between 5 – 25 depending on the body’s natural healing rate and the severity of the condition. If you are interested, please watch the introductory video on Theralase, our cold laser therapy. “I use the Theralase laser treatments to keep my throwing arm healthy. It reduces fatigue and allows me to play at my peak, game after game,” says Roy Halladay #32, Pitcher, Toronto Blue Jays. “The laser therapy helped my pulled quad before racing. Not having the Theralase therapeutic medical laser system for treatment is like Superman forgetting his cape,” says Johnny Grey, Four time Olympic medalist.